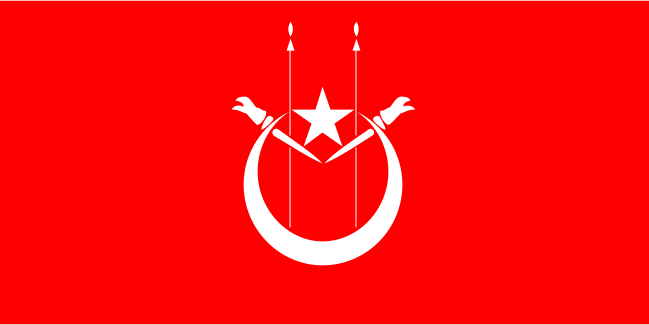 Kelantan is a state of Malaysia. The capital and royal seat is Kota Bharu. The Arabic honorific of the state is Darul Naim, ("The Beautiful Abode"). Kelantan is positioned in the north-east of Peninsular Malaysia. It is bordered by Thailand to the north, Terengganu to the south-east, Perak to the west, and Pahang to the south. To the north-east of Kelantan is the South China Sea. Kelantan is a land of colourful traditions and scenic beauty. Located in the north-eastern corner of the peninsula, Kelantan, which translates as the "Land of Lightning", is an agrarian state with lush paddy fields, rustic fishing villages and casuarina-lined beaches. Kelantan is home to some of the most ancient archeological discoveries in Malaysia, including several prehistoric aboriginal settlements. With the Islamic Party of Malaysia (PAS) in power for many years, Kelantan is also Malaysia's most socially conservative and Islamic state. The name Kelantan is said to be a corruption of gelam hutan, i.e. the Malay word for the cajuput, or swamp tea tree (Melaleuca leucadendron). Other theories claim the name comes from the Malay word kilatan, 'shiny/glittery' or kolam tanah, 'clay pool'. The early history of Kelantan traces distinct human settlement dating back to prehistoric times. Early Kelantan had links to the Funan Kingdom, the Khmer Empire, Srivijaya and Siam. Around 1411, Raja Kumar, the ruler of Kelantan, became independent of Siam, and Kelantan became an important centre of trade by the end of the 15th century. Around 1760, a chieftain of Kubang Labu in Kelantan succeeded in unifying the territory of the present Kelantan. Shortly thereafter, in 1764, Long Yunos was appointed as the Penghulu of Kota Bharu while his brother, Nik Muhammadiah, ruled as Sultan Muhammad I of Legeh in Kok Lanas. Nik Muhammadiah or Sultan Muhammad I, officially became the first sultan of Kelantan. In the early 1980s, trunk roads were built to link it with nearby states. Presently, one can travel by road from the capital city Kuala Lumpur to Kota Bharu through the mountain range within 5 hours. Kota Bharu, the capital, is the major urban centre, and there are also plans to open up the southern portion of the state under an ambitious multi-million-dollar development project. The main market at the city centre is a top attraction. Kelantan has a GDP per capita at about RM6000, which is about one-third that of other richer states like Selangor and Penang. But, it is a well-known fact that many Kelantanese are involved in small businesses and enjoy good income, but not reflected in the GDP calculation since in most cases the income is not reported. Starting from 2008, Kelantan will have its own airline company, Amrose Air, with Sultan Ismail Petra Airport as its hub. Amrose Air plans to service both domestic and international routes, with the international destinations including Bangkok (Thailand) and Jeddah (Saudi Arabia). 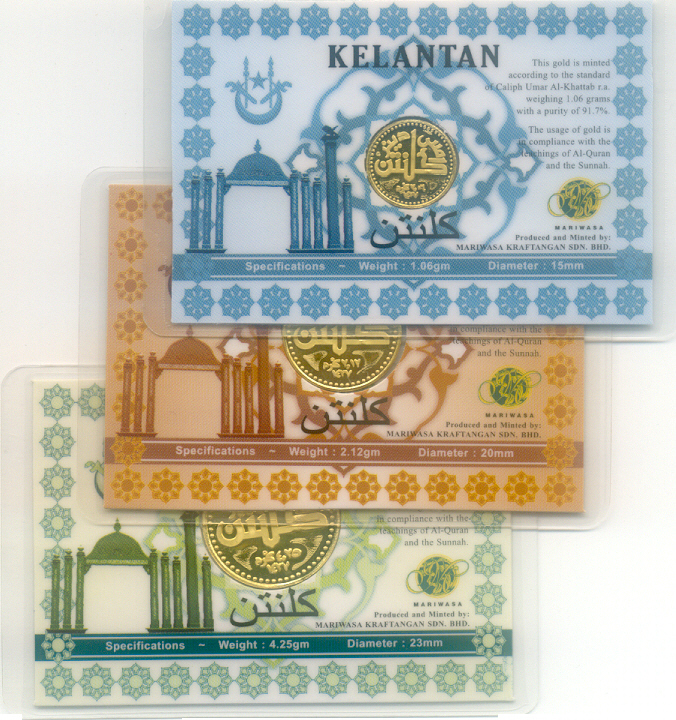 Impressed by the Islamic Mint concept, the Kelantanese dinar is a currency that was created by the Government of the Malaysian state of Kelantan in 2006 (27 Shaban 1427 AH corresponds to 20th Sep 2006). The currency code was decided as KED. The Kelantanese Government attempted to give the dinar a legal tender status, but this was vetoed by the federal Malaysian government in Kuala Lumpur. Interestingly, the dinar has now been issued, albeit, without a legal tender status. The only currency that is legal tender in Kelantan is the Malaysian ringgit. The coins have a metallic composition of 22 carat gold. There are 4 denominations - 1/4, 1/2, 1 Dinar and a commemorative 2 Dinars. Know that there is consensus [ijma] since the beginning of Islam and the age of the Companions and the Followers that the dirham of the shari'ah is that of which ten weigh seven mithqals [weight of the dinar] of gold. The weight of a mithqal of gold is seventy-two grains of barley, so that the dirham which is seven-tenths of it is fifty and two-fifths grains. All these measurements are firmly established by consensus." Ibn Khaldun, Al-Muqaddimah". The Islamic gold dinar (sometimes referred as Islamic dinar or Gold dinar) is a bullion gold coin made from 4.25 grams of 22k gold with historical Islamic significance. 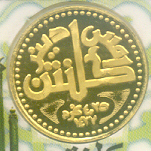 Gold dinar may also refer to various historic gold coins denominated in dinars. There are information that dinar are being used privately by 22 nations. Today’s gold dinar is minted in 4 nations. There are also online transactions using dinar and dirham via the internet. As a consequence of currency crisis in Asia, in first of 1997, then Prime Minister of Malaysia Mahathir bin Mohamad proposed introduction of Islamic gold dinar as currency for international trade in the Muslim world. It was supposed to suppress the too overly traded American dollar and ensure that dollar's instability does not affect international trade because Islamic gold dinar was to be tied to price of gold and thus provide stable value of the currency. Mahathir announced that Malaysia was to start using the dinar in mid-2003, but when in 2003 Abdullah Ahmad Badawi replaced him as Prime Minister of Malaysia, this idea was halted. On the 20 September 2006, Kelantan became the first state to launch gold dinar coins. It features the Kelantan state crest, the date of production, as well as the weight and purity of the gold used on its face. The DEK(dinar emas Kelantan) is similar to the original dinar in weight and purity of gold used. The coins can be bought and sold at the Kelantan Corporation Bhd (Permodalan Kelantan Bhd) and in all nine Ar-Rahn Islamic pawnshops in the state. Where to buy: Ar-Rahn outlets in Kelantan Province: http://www.dinarkel.com/wtb.html and also branches at: http://www.pkb.net.my/arrahn/rangkaian.html. I got my Quarter Dinar (1.06g 22K) in Blue leaflet, Half Dinar (2.12g 22K) in Orange-Red leaflet and One Dinar (4.25g 22K) in Green leaflet coins from my Malaysian colleague Lokman Bin Omar through one of the Ar-Rahn Islamic pawnshops in the Kelantan state (Ar-Rahn Machang, Lot PT 371, Tingkat Bawah, Jalan Bakat, 18500 Machang, Kelantan, Malaysia. Tel: 09-975 0050. Fax : 09-975 0052). There is also a 2 Dinars 22K 8.5g coin in Yellow leaflet issued on the occasion of 57th Birthday celebration of His Royal Highness The current Sultan of Kelantan: Ismail Petra ibni al-Marhum Sultan Yahya (Born in 1949, Regent: 21st Sep 1975 to 29th Mar 1979 then Sultan since 29th Mar 1979). Probably the 2 Dinars coin had a limited mintage or in high demand that I was not able to grab any of them. All these coins are having the description "EMAS DINAR KELANTAN" with Kelantan arms. Weight in grams in written in both Malay and English languages. The AH 1427 corresponds to 2006-2007 CE are also visible on these coins. The word "Emas" written in Malay language using Arabic script means gold. According to my knowledge only these four gold coins are introduced by Kelantan State. So far I have not heard of any silver denomination Dirham(s) coins issued by Kelantan state. These coins are produced and Minted by: Mariwasa Kraftangan Sdn. BHD. These coins are inserted inside holed colorful cardboard with an extra-thick transparent plastic lamination to make them sturdy. This way the coins will retain their weight and look authentic. Silver - 1, 2, 5, 10 and 20 Dirhams. Gold - 1/2, 1, 2, 5 and 8 Dinars. The obverses depict a monogram in Arabic within a decorative border. 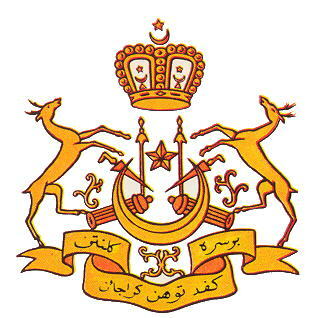 The reverses of these pieces depicts the full Kelantanese Coat-of-Arms. One official agent has been appointed to sell the coins to the public in Kuala Lumpur at: http://www.nubex.com.my/v2/. The website at: http://www.dinarkel.com/ has been updated to reflect the introduction of the new Kelantanese coins.